Rafael Nadal claimed an 11th French Open title yesterday with a 6-4, 6-3, 6-2 demolition of Dominic Thiem despite a worrying injury scare in the closing stages of the final. 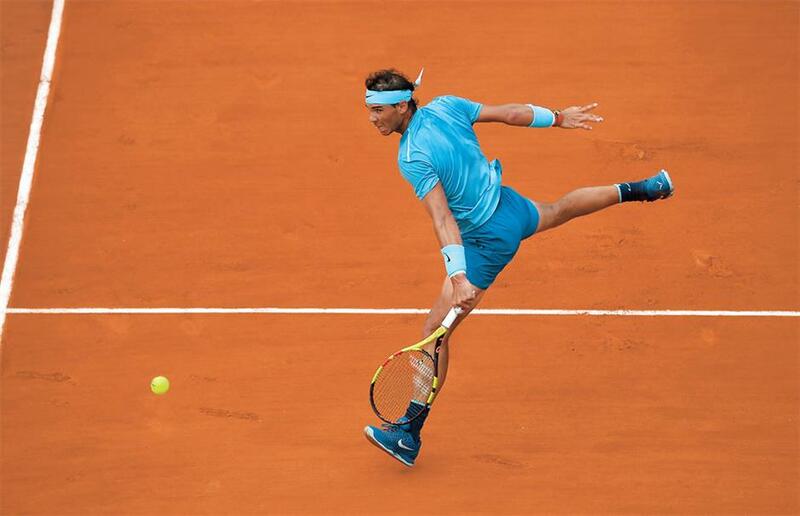 Spain’s Rafael Nadal plays a backhand return to Austria’s Dominic Thiem during their French Open final at Roland Garros in Paris yesterday. The world No. 1 romped to a 6-4, 6-3, 6-2 victory to capture his 11th title on Paris’ red dirt. The 32-year-old world No. 1 now has 17 Grand Slam titles, just three behind great rival Roger Federer. “It’s really incredible. I played a great match against a great player,” said Nadal. “I had tough moment in the third set with cramps in my hand. I was very scared but that’s sport — it was very humid. With a celebrity audience — including actors Hugh Grant and Tim Roth as well as French stars Marion Cotillard and Jean Dujardin — watching, Nadal flew out of the blocks. He reeled off the first six points for a 2-0 lead before Thiem settled and repaired the damage for 2-2. The Austrian speared a 222 kilometers per hour ace just for good measure in the fourth game to save a break point. He saved another two in the 11-minute sixth game, a performance cheered by the crowd who briefly became more animated when glum-looking French football icon Zinedine Zidane was spotted in the stadium. Thiem wasted a break point in the seventh game as Nadal collected a time violation for taking too long to serve. The world No. 1 saved it and went on to secure a two-set lead when yet another backhand from the Austrian drifted wide. Bizarrely, Nadal then halted playing in the fourth game complaining of pain in his left hand and stretching his middle finger. He still won the game anyway before summoning the doctor and trainer courtside. Whatever the problem, his dominance remained and a love game took him to 4-2 before he eventually sealed victory on a fifth match point when Thiem fired another backhand long. Earlier, Eri Hozumi and Makoto Ninomiya’s hopes of becoming the first all-Japanese pair to win a Grand Slam women’s doubles title were swamped by a barrage of big hitting from Czech pair Barbora Krejcikova and Katerina Siniakova in the final. The sixth seeds won 6-3, 6-3 in just 65 minutes against Hozumi and Ninomiya who had stunned top seeds and Australian Open champions Kristina Mladenovic and Timea Babos in the semifinals. For the 22-year-old Czechs, it was their first Slam title. “I’d like to dedicate this victory to Jana Novotna,” said Krejcikova in honor of her compatriot and 1998 Wimbledon champion who died of cancer in November last year at age 49.